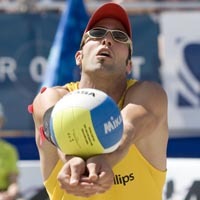 Schneider and Julius Brink captured a bronze medal for Germany at the 2005 SWATCH-FIVB World Championships in Berlin before winning the only All-German gold medal in SWATCH history three weeks later in Espinho, Portugal. Married (Brigit) with a son (Hammer), he is the son of Klaus (ministry of economics) and Sigourn Schneider (a teacher). He has an older brother. The athletes he admires - The one who risk their lives to help others. His most memorable moment in life - The birth of his son. His most memorable moment in Beach Volleyball - Winning the bronze medal with Julius Brink at the 2005 SWATCH-FIVB World Championships in Berlin. Off-the-sand, he describes himself - Open to almost everybody and happy. The people that have helped him the most in life - His parents. The people that have helped him the most in Beach Volleyball - His parents, Okka and Stephen. The best advice in life he has received - If you do something, don�t do it halfway, do it right. The three people from history he would like to have dinner with - His grandfathers and mother, Michael Jordan and Bill Gates.